After a joyous reunion with Tony La Russa in St. Louis, and a successful first year as the hitting coach of his beloved Cardinals, the man know to millions as simply “Big Mac” is hard at work getting the redbirds’ speedy young guns ready to battle for the National League Central crown. The drama continues between the Cardinals’ coaching staff and 24-year-old outfielder Colby Rasmus, who fancies himself as a power hitter — a 30-homer guy who just happens to steal bases. 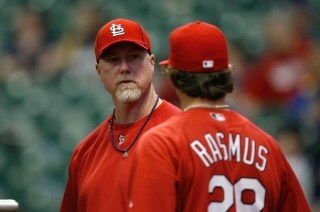 McGwire and St. Louis Manager Tony La Russa have been counseling Rasmus to try to become a more gap-to-gap type of batter and to use his legs to produce runs. McGwire’s off-season regiment for Rasmus – and for the entire team – is to slim down, lighten up on the weight training and work on their fast-twitch leg muscles. While it’s odd to discourage any young hitter from trying to drive the ball deep, Rasmus has struggled with high strikeout numbers and has posted some rather alarming fly ball rates in his first two major league seasons. In 2010, he had the 11th-highest fly ball percentage in the game, lofting batted balls 48.6% of the time. McGwire and La Russa are probably thinking that a more contact-minded approach at the plate will help Rasmus become a better all-around hitter.